One of the things my grandfather used to always tell me about his family tree was that both of his grandparents were named William and Catherine. There was the German William & Catherine, and the Irish William & Catherine. 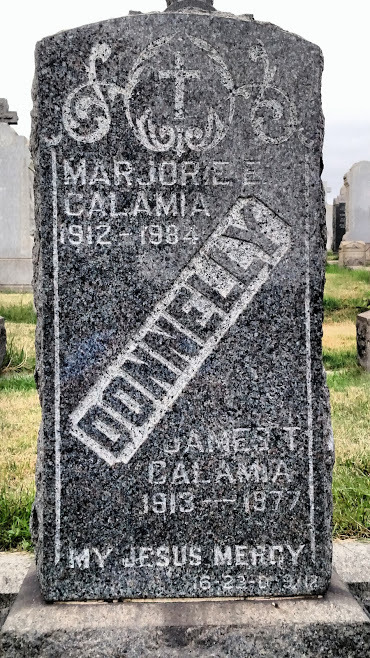 Recently, I visited the Donnelly Family Plot in Calvary Cemetery. Getting there was no easy feat. In fact, this was the cemetery that was next on my list to visit after getting the flat tire that started this blog. To begin this story, I want to backtrack a few years ago to when I first started making inroads on the Donnelly branch of my family tree. My great-great grandfather William J. Donnelly was born on July 25, 1881. I knew this because my grandmother had an original copy of his baptismal certificate from the Church of St. Teresa in Manhattan. Aside from asking members of your family to recite the family legends and lore, you should always go through old collections of documents because you never know what gems you will end up uncovering. What else did I know about him? At the time, I was only able to locate him in one census record, which was from 1910. From the record, you can see that William (at age 28) was living in the Bronx with his wife Catherine and their two young daughters Veronica (my great-grandmother) and Abigail (known in my family as Aunt Abby). William was listed as working as a mechanic and they are listed as being married for 3 years. This was the last census record I had for William though. As I found more information on my great-grandmother Veronica, Aunt Abby, and my great-great-grandmother Catherine, there was no sign of William. In fact, by 1920, Catherine is listed as widowed, left to raise two daughters by herself. I could not imagine what it must have been like for Catherine. Back then, women stayed at home and a big reason for that was motherhood. Catherine now had to do it all – raise her two daughters and financially support a household of three. What happened to William though? For the longest time, I had no clue. 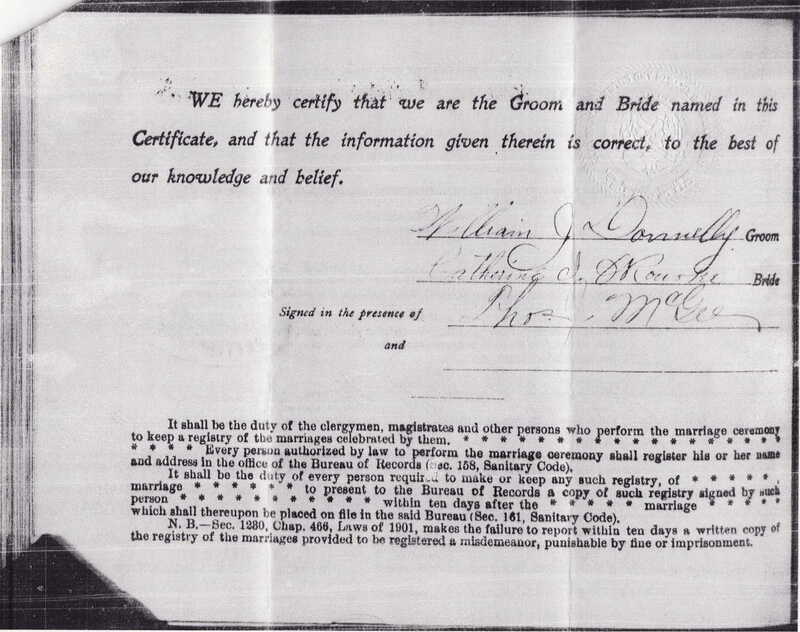 The only other document I was able to easily hunt down was his and Catherine’s marriage certificate. To the non-Irish, Donnelly may not sound like a common last name but as I like to frequently describe it, it might as well be the Irish version of Smith. There are so many Donnellys. There are 4 men named William J. Donnelly alone on this directory page. So, finding the correct Donnelly can be quite the task. Not to mention, I don’t think any of these Donnelly’s are mine as he would’ve only been 18 at the time. Plus, the Michael Donnelly that is listed as an engineer is his father and none of the Williams listed are at his address. But this just goes to demonstrate the difficulty in researching the Donnelly surname. A breakthrough eventually came after years of trying to identify William’s death date. I even bought the wrong death certificate at one point. To understand my pain, see the below search results from ItalianGen used to whittle down the William Donnellys that died during the timeframe my great-great grandfather did. Since he was living in the Bronx at the time, I figured I could whittle it down further by searching only for the William Donnellys that died in the Bronx. BINGO! I thought I had my guy. In 1919, at 38 years old, he would have been born in 1881. I thought for sure this was my guy. The death certificate came in the mail, but it wasn’t him. I’ll have to get around to uploading the certificate for this William Donnelly to hopefully save someone else 15 bucks. 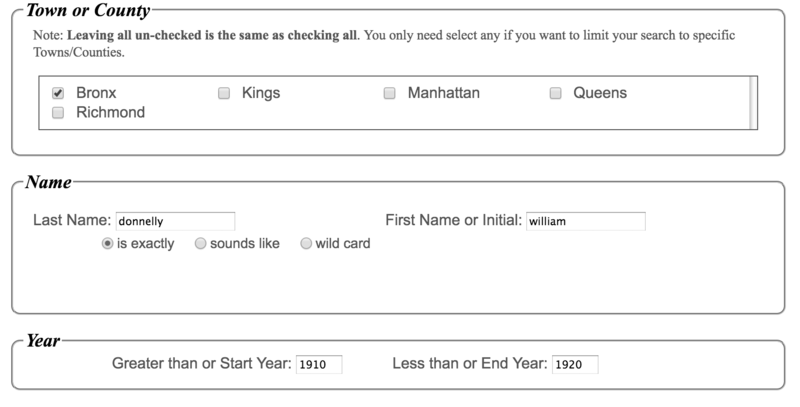 Anyways, my next option was to go back to the original 22 search results and see which Williams lined up near the 1881 birth year. Perhaps, he didn’t die in the Bronx, I thought. Luckily, at some point, I didn’t have to do that because FamilySearch.org started including more details on the death certificates in their search results. See below. The only difference was that the birth year is 1883 instead of 1881. 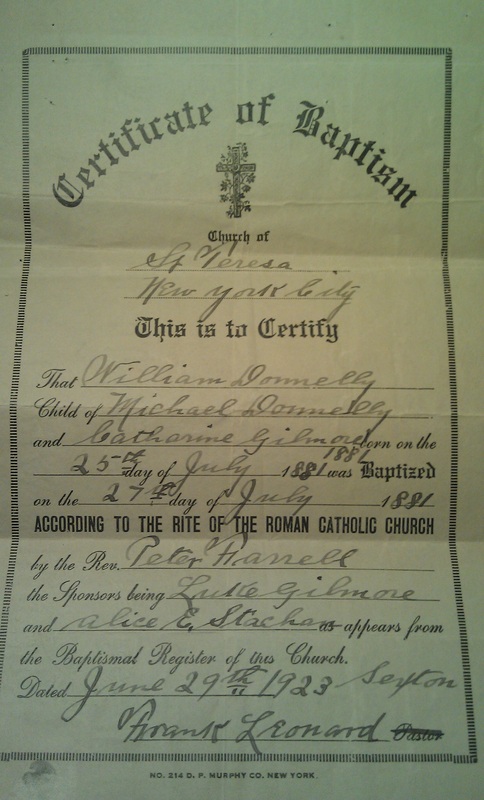 So, either his death certificate is incorrect or his baptismal certificate was off by two years (It was dated in 1923 – 8 years after his death – so it could be that the copy of the baptismal certificate was incorrectly transcribed). Making this connection in addition to finding the birth and death dates of some of William’s siblings, I was finally able to locate him and the rest of his family in the 1900 census. 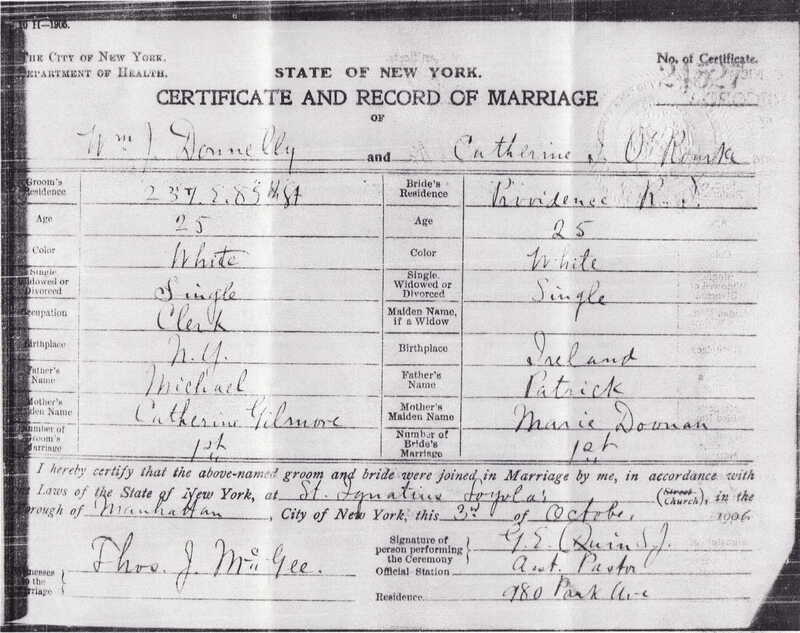 According to this census, Michael and Catherine Donnelly had been married for 35 years and had 9 children together, 5 (or 6) of which were still living. Uncle Daniel Gilmore (Catherine’s brother) was also living with them at this time. You should always remember to look for “boarders” with other family surnames to help identify if this is indeed your family, particularly for those with common surnames like Donnelly. Turns out Gilmore isn’t as prevalent as Donnelly. As you can see here, William lived with his 3 older sisters, Elizabeth, Annie, and Louise. His birthday is also listed as July 1881. So, my guess it that he was born in 1881 instead of 1883. 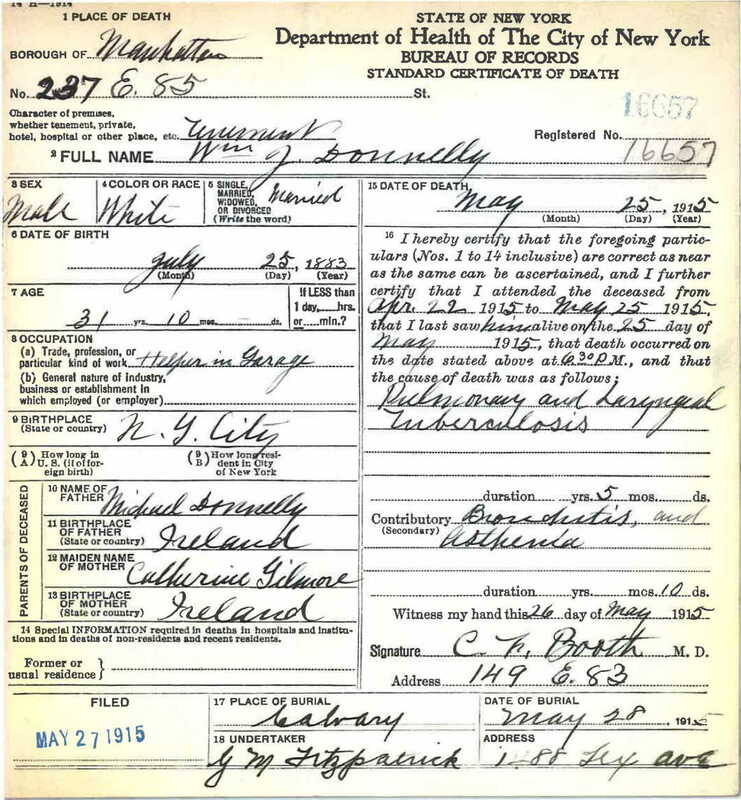 On May 25, 1915, William J. Donnelly, my great-great grandfather, passed away at his parents’ house in Manhattan from complications with pulmonary and laryngal tuberculosis. He is buried at Calvary Cemetery at the Donnelly Family Plot with about 15 other relatives that includes his parents, his siblings, and his niece Marjorie E. Calamia, and her husband James Thomas Calamia (the last two that were buried at this plot). I hope to learn more about all of the people that are buried here. If you are related to me through the Donnellys, I would love to connect with you. Calvary Cemetery charges a substantial fee (over $100) to provide all the names and death dates of each person buried in family plots. So, again please support my endeavors. Share this with friends. 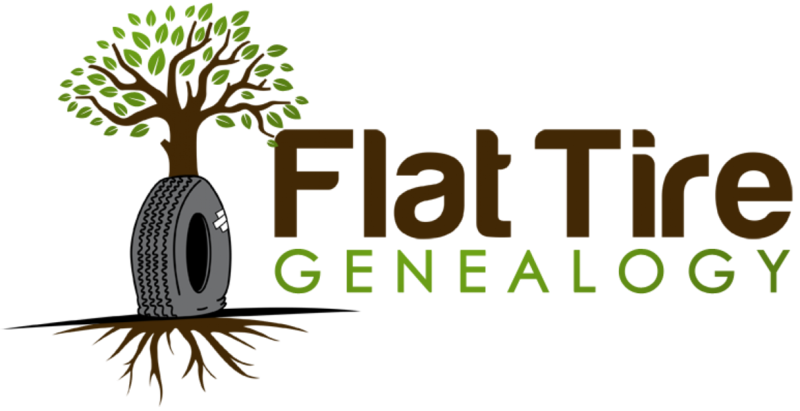 Book a genealogy trip with me. All of my proceeds from this are going to be reinvested in preserving the memories of my ancestors and I hope one day in the future I can do a follow-up to this post including all of the names of the people buried here as well as hopefully giving each one of them a headstone. All in time. Keep digging!